This book was the first major project of the Society and, after six years of work, it was completed in 2002. This 459 page work was edited by Prof. James W. Ely, Jr., Underwood Professor of Law and Professor of HIstory at Vanderbilt University, with authors, Theodore Brown, Jr., Timothy S. Huebner, R. Ben Brown, Ruth Anne Thompson, John R. Vile and Carl A. Pierce. Published by the University of Tennessee Press, Knoxville, 2002. The Tennessee Library Association named A History of the Tennessee Supreme Court the History Book of the Year for 2002. And with the generous financial support of the Frist Foundation, the Society has distributed the book to every public high school in Tennessee. From the Preface of A History of the Tennessee Supreme Court : This book is the first attempt to treat systematically the development of the Tennessee Supreme Court, and to assess its place in the state's polity . . . [It] treats a number of issues, including the evolution and organization of the Supreme Court, biographical information about the judges, the changing nature of the Court's case load, judicial review, issues pertaining to judicial selection and tenure, the relationship between the Court's work and the social and intellectual climate of the state, and governance of the bar. The Court was often at the center of major political and economic controversies. Coverage encompasses diverse substantive areas of both public and private law, such as state constitutional law, property law, slavery, economic rights, criminal justice, family law, regulation of business enterprise, and race and gender relations. The book also addresses such contested issues as the Court's role in Reconstruction. 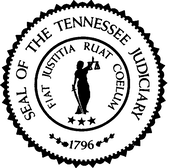 A History of the Tennessee Supreme Court can be purchased by clicking here.